The title, Die, Monster, Die is very misleading and the movie is much better than the title, or the movie poster would lead you to believe. It begins with a young man (Nick Adams) visiting a young woman that he knew in college (Suzan Farmer) at her house finding the townspeople unwelcoming, and the girl’s father (Boris Karloff) even more so, and he soon realizes that there is something strange happening something that may lead to death. Susan Witley (Suzan Farmer, Rasputin: The Mad Monk, Dracula; Prince of Darkness). That beautiful young woman, recently returned home from college. Her mother is ill, her father is wheelchair bound, and the family butler also seems ill.
Nahum Witley (Boris Karloff, Son of Frankenstein, Bedlam). The head of the house, an invalid in his wheelchair. He knows what is going on and believes that he can use it to overcome his father’s evil influence, and make the Witley name a positive force once again. At the end, he is willing to risk his own life to destroy it. Merwyn (Terence de Marney, The Wreck of the Mary Deare) the Witleys’ faithful butler, who seems ill and eventually dies, leaving only trace ashes in the shape of a human being behind. 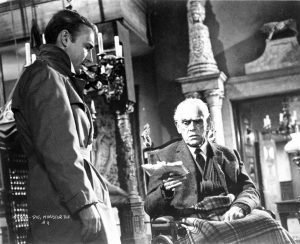 Dr. Henderson (Patrick Magee, Dementia 13, The Masque of the Red Death) a secondary character; the doctor who attended Nahum Witleys’ dying father and whatever he saw drove him to alcoholism. Die, Monster, Die is loosely based on a classic story by H.P. Lovecraft, The Colours out of Space. The basic conflict has to do with a meteorite that Nahum Witley believes that his father summoned by occult practices. The meteorite causes strange changes to both animal life and human being. Scoffing at the supernatural, Stephen Reinhart believes that its merely radiation the causes the change. But the story lets the audience decide for themselves. Die, Monster, Die is a good scary movie, that sets up the atmosphere, and slowly builds to the conflict, unraveling the issues slowly. The atmosphere and cinematography are good, setting up an atmosphere that’s more dreary than frightening. The acting is good, with Boris Karloff turning in his expected good performance, as does the rest of the cast. The largest negative comment that I have is that the first ten minutes or so are very slow. But the rest of the movie makes up for that. I rate Die, Monster, Die as 4 stars out of 5. In Die, Monster, Die American International Pictures production designer Daniel Haller donned the director’s jodhpurs for the studio’s second attempt at bringing horror master H.P. Lovecraft to drive-in audiences. The script, adapted from the author’s favorite story, The Colour Out of Space, by science fiction scribe Jerry Sohl (who later adapted another AIP/Lovecraft film, The Curse of the Crimson Altar), moves the location from rural New England to present-day Great Britain, where American Stephen Reinhart (Nick Adams) is visiting the ancestral home of his fiancée (Suzan Farmer from Dracula, Prince of Darkness).